As the leader of a Java™ organization, you struggle to deliver business value and innovation to market faster than your competition. Your application development teams must meet strict, diverse requirements while improving efficiency and decreasing costs. To keep up with today’s pace, your organization has to deliver new applications and updates in days or weeks—not months. But speedy delivery of new features is not the only requirement. Applications must also be reliable, perform smoothly at large scale with millions of connections, and meet strict security and compliance expectations. Beyond rapidly delivering high-quality applications, your teams must grapple with application deployment in different environments. Legacy applications are mostly deployed in on-premise or virtual environments, and new applications are increasingly being deployed into private, public, and hybrid cloud environments. Rapidly deploy web-scale Java EE applications to cloud environments. Attain high levels of developer productivity. Red Hat® JBoss® Enterprise Application Platform (JBoss EAP) is the market-leading open source platform for modern Java applications deployed in any environment—on-premise, virtual, public, private, or hybrid cloud. JBoss EAP is well-suited for organizations with demanding reliability, security, and compliance requirements that need developer-friendly technology, high productivity, and flexible deployment. Organizations that use JBoss EAP can support a wide range of Java applications, including HTML5 mobile applications, microservices apps, and highly transactional applications that use the Java EE programming approach. JBoss EAP helps deliver business value more quickly and with greater flexibility, resulting in lower costs, fast and easy scale out, and reduced IT complexity. Organizations moving to JBoss EAP have achieved 509% return on investment over three years, while developing 70% more applications per year with 35.5% less developer hours per application. A full web services stack. 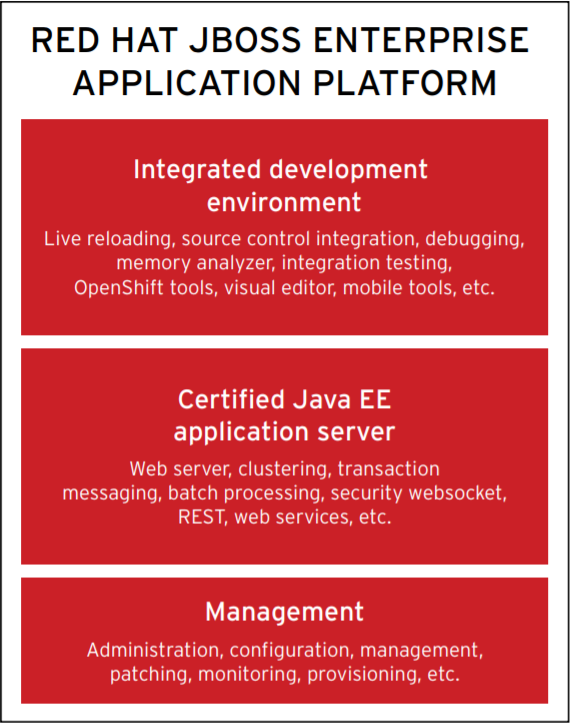 JBoss EAP has everything you need to build, run, deploy, and manage enterprise Java applications in any environment, including across hybrid cloud environments. It supports a wide range of application requirements, as well as integration with a variety of standards, and is completely open source. This provides technical flexibility and helps you avoid switching costs related to vendor lock-in. Try Red Hat JBoss Enterprise Application Platform on OpenShift Online. Discover the benefits of developing Java EE applications in a Platform-asa-Service (PaaS) environment. Leave provisioning, management, and scaling behind and focus on the important work— writing code for your next big Java application. Virtualization platforms like Red Hat Virtualization and VMWare ESX. Private cloud environments like Red Hat OpenStack Platform. Public cloud environments like Microsoft Azure or Amazon Web Services. JBoss EAP is well-suited for microservices, as well as traditional applications. This provides the flexibility to build applications as they are needed. 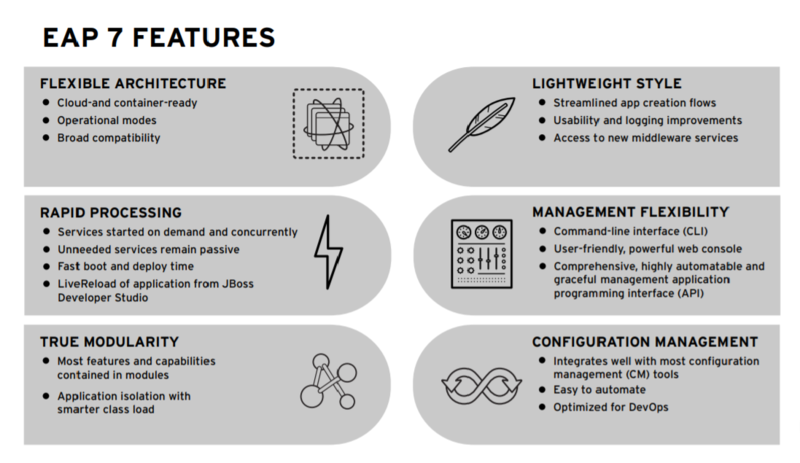 By offering compatibility with popular continuous development and continuous integration (CI/CD) tools and technologies, JBoss EAP helps boost developer productivity and allows DevOps methodologies. Highly efficient and optimized for container and cloud deployments. JBoss EAP 7 offers an extremely low memory footprint, fast start-up times, efficient resource utilization, reduced port usage, and management and monitoring over HTTP (REST). Able to support your application as it evolves through resource-efficient scale out, high-density deployment options, and dynamic scaling. Lightweight, with a small footprint that minimizes hardware resources and costs, especially when deploying applications into resource-constrained environments, such as in cloud environments or containers. Fast to start-up, saving developer cycle time during development and testing while providing fast, elastic scale out in production. Figure 2. 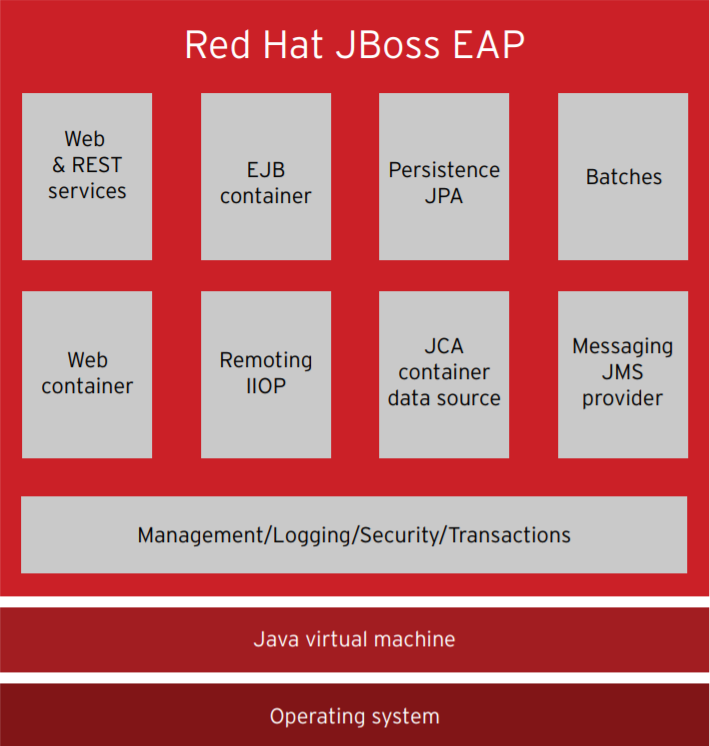 Red Hat JBoss EAP Features. 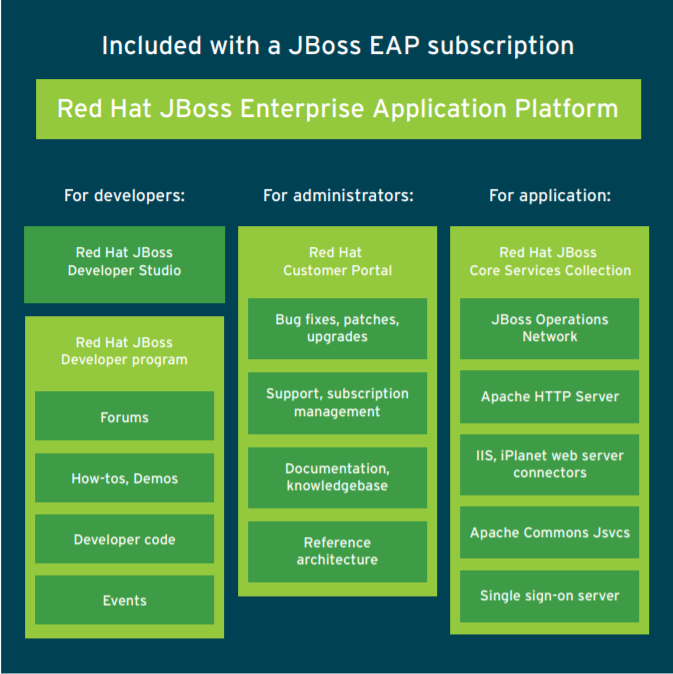 Download Red Hat JBoss Enterprise Application Platform. All of our products are open source, which means you can install them, run a demo, and develop a proof-ofconcept. Eliminate risk by trying the software before you buy. Explore a rich library of resources. Get up to speed fast by viewing a webinar, trying out a tutorial, or watching a demo. When you deploy Red Hat JBoss Enterprise Application Platform into Red Hat OpenShift environments, you gain full Java EE capabilities in both private and public cloud environments. Since you don’t have to create or maintain the development environment, you can prototype ideas quickly and take successful ones to market faster. Red Hat’s application hosting platform also makes it easy to run container-based web applications. Self-service application provisioning, simplified stack management, and application autoscaling help boost productivity and improve application design and delivery. And Red Hat OpenShift Container Platform lets you take advantage of Linux® containers based on Docker technology and Kubernetes container orchestration for app development and deployment. JBoss EAP can maximize administrative productivity, making it simple to efficiently maintain and update any scale of Java EE deployment. JBoss EAP 7 features an updated management console user interface that includes intuitive navigation and support for large-scale domain configurations. In addition, management using the updated command-line interface (CLI) provides administrators with a quick, unified view into configurations and subsystems and offers the ability to manage servers offline. The CLI can be used with popular configuration management tools such as Red Hat Ansible Tower or Puppet. Together, the management console and CLI make editing XML configuration files unnecessary. With JBoss EAP, administrators can now perform minimally disruptive maintenance using the new server suspend mode to gracefully shut down servers. JBoss EAP is performance-tuned for highly transactional applications, providing you the flexibility to quickly build and deploy applications while simultaneously meeting strict compliance, security, and regulatory requirements. Meet a diverse range of Java application requirements with a combination of Java EE 7 compliance, integration with the latest open standards, and the addition of enterprise capabilities such as failover, high-availability clustering, distributed caching, intelligent load balancing, and distributed deployment. Maximize throughput and scalability for environments with millions of connections with Undertow, a highly scalable, non-blocking I/O (NIO) modern web server. Undertow can also be configured to function as a multiplatform load balancer. Reduce latency and improve load times with support for HTTP/2 standards (technical preview for JBoss EAP 7), which compresses headers and multiplexes data streams over a single Transmission Control Protocol (TCP) connection. HTTP/2 also allows servers to push resources to the client before it has requested them, leading to faster page loads. Prototype ideas quickly. With JBoss EAP and Red Hat OpenShift Container Platform you can boost your productivity with features like self-service application provisioning, simplified stack management, and application auto-scaling. Automate CI/CD infrastructure. Tools like Red Hat CloudForms and Red Hat Ansible Tower help automate provisioning and configuration, whether you are running on-premise or in public, private, or hybrid cloud environments. And with Arquillian for integration testing, Maven for automated and managed build processes, and Jenkins for continuous integration, you can respond to new requirements faster than before. Integrate your third-party web interfaces with support for popular frameworks, including Spring, Spring Web Flow, Spring WS, Spring Security, Arquillian, AngularJS, jQuery, jQuery Mobile, and Google Web Toolkit (GWT). JBoss EAP 7 is a certified Java EE 7 application server that supports Java SE 8. Java EE 7 includes four new specifications that help developers be more productive and build web-scale applications. Web services standards like Simple Object Access Protocol (SOAP) and associated WS-* standards. Security standards such as Security Assertion Markup Language (SAML), WS-Trust, and SPNEGO/Kerberos. Connectivity standards such as Java Database Connectivity (JDBC). The latest web standards, including HTTP/2, HTTP Upgrade, and WebSockets. Is backed by Red Hat’s support and services organization, with access to Red Hat’s award-winning Customer Portal. Includes entitlements to several popular application development tools. Eliminates complicated purchasing choices that lock you into limited approaches, strategies, and business opportunities. Can make existing applications more efficient. Supports deployment across multiple environments. Lets you move applications to hybrid or cloud environments on your own timeline. Red Hat Core Services Collection provides entitlements to popular capabilities that are frequently deployed with applications built with Red Hat JBoss Middleware technologies. JBoss Core Services entitlements are included at no additional charge with subscriptions for JBoss EAP and many other JBoss Middleware products. Subscribers receive full support for JBoss Core Services Collection, including online and phone support, updates, patches, and security fixes. Red Hat Operations Network, which provides management, monitoring, and metrics from a centralized point for all your Red Hat Middleware products. This helps improve operational efficiency, reduce costs, and provide a more positive experience for your users. Entitlements for Apache HTTP server, which allows JBoss EAP applications to handle incoming web requests. Microsoft Internet Information Services (IIS) Connector. Red Hat Developer Studio is a bundled Eclipse IDE that supports your entire development life cycle and includes tools for developing, testing, and deploying rich web applications and enterprise applications. There is no need to buy multiple subscriptions to build and test on Red Hat Middleware products or pay production service-level agreements (SLAs) to get support. It’s all included. Red Hat can help you make the move from IBM WebSphere or Oracle WebLogic application servers to JBoss EAP. Red Hat Consulting has a full complement of migration engagements, including methodology, tooling, and migration factory services. For JBoss EAP 7, migration operations help you quickly upgrade from older versions of JBoss EAP or Wildfly. JBoss EAP 7 provides interoperability with existing JBoss EAP 6 environments through improved protocol version support and tooling. The new messaging subsystem is based on Red Hat’s unified messaging technology, Apache ActiveMQ Artemis. ActiveMQ Artemis lets you pass messages between JBoss EAP 6 and JBoss EAP 7 and preserves the performance, scalability, and reliability of HornetQ from JBoss EAP 6. Delivering the level of innovation and productivity your customers demand continues to challenge even the most efficient developers. To meet these demands, you need an application development platform that can support your on-premise infrastructure and the additions you make to it in the future. Red Hat is a vendor proven to provide enterprises with the engineering and support they need. JBoss EAP pushes beyond the Java EE spec to offer additional enhancements focused on developer-friendliness and high productivity. The platform helps you modernize application delivery, standardize across on-premise and cloud architectures, and work seamlessly with the latest developer tooling and DevOps practices. An infrastructure based on JBoss EAP lets you keep pace with new cloud architectures and microservices-based processes. This gives your modern enterprise the flexibility, agility, and speed to deliver innovative applications to market faster.